Sometimes it’s fun to be a tourist in your home town. With Lake Michigan to the east and the Chicago skyline to the west, south, and north, Buckingham Fountain is a fun place for people and dogs. The fountain is one of the largest fountains in the world. Located at Columbus Drive and Congress Parkway in Grant Park in downtown Chicago, the fountain operates from early April through mid-October, depending on the weather. Leashed dogs are permitted in Grant Park and around Buckingham Fountain, but not in nearby Northerly Island, Millennium Park, and Maggie Daley Park. The Fountain produces a major water display for 20 minutes every hour with a center jet shooting water 150 feet in the air. At dusk, spectacular lights accompany the water display, every hour on the hour for 20 minutes with the final display beginning at 10:35 p.m. When the wind blows, the water lightly mists the surrounding pavement and any dogs (or people) who happen to be nearby. Buckingham Fountain opened to the public in 1927. Inspired by the Latona Fountain at Versailles, the fountain was designed by Edward H. Bennett in collaboration with French sculptor Marcel Loyau and engineer Jacques H. Lambert. The massive fountain, composed of four basins made of carved granite and pink marble, symbolizes the power and enormity of Lake Michigan. The lower basin features four bronze sea horses representing the states that border the lake. 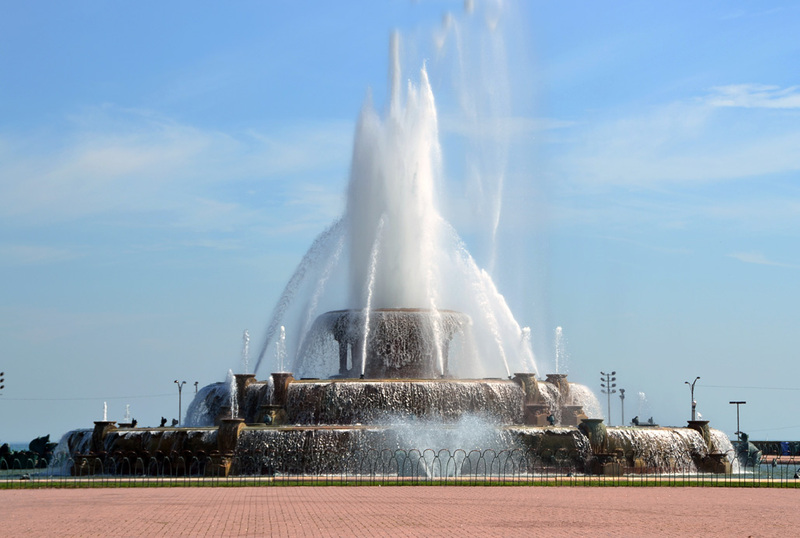 Buckingham Fountain and Grant Park are both dog-friendly and a great place for a walk, as long as your dog is comfortable with crowds. The surrounding gardens in Grant Park are shady (in parts), but the immediate area around the fountain is full sun so bring water. Unless there’s an event or festival going on, the park also offers a break from the crowds and plenty of open space for walks. This was Ruby’s first trip downtown and she handled it like a pro. She’s sometimes a bit reactive with people she doesn’t know, especially unfamiliar men. We have been working to help her feel more comfortable and less anxious in new situations. Our trip to Buckingham Fountain was a big test and she passed with flying colors! Disclaimer: Ruby is ALWAYS leashed when outside our home. I photoshop her leash out of photographs for aesthetic reasons, but would never remove her leash in real life. Oh Ruby, I bet that was a fun place to go. Good for you for being such a good girl. We are so glad that you have that wonderful family and we just know that is why you are getting more confident in life. You all have a great day. You are doing an amazing job with Ruby getting her more comfortable and confident by taking her into environments that might make her uncomfortable. What a beautiful place you choose to take her, the fountain and photos are lovely. This is great. I grew up in Chicago, and now live on the IL/WI border, far NE corner. It is see to see good things about Chicago. I remember the good. You're so right, Ruby! Mommy had friends in town yesterday and zje told them "I don't know what's around here. I'm never in this part of town." Maybe she should start being a tourist! I've been to Chicago a couple times but never really as a tourist. When I go again, I would love to have Ruby as my tour guide. 🙂 And that fountain looks very cool! What a beautiful fountain. Anything with seahorses is a hit with me! I'm glad Ruby did so well visiting the city and park and I'm sure it will go a long way in helping her with the reactivity. She's a sweetheart! I think Magic would try to bite the water in the fountain…what a great place to relax! What a great spot. Thanks for sharing it. YES!!! My hometown. I got my first dog when I lived in Chicago. I never took her to Buckingham Fountain, but that would have been fun. We'd go to the dog beach (is it Montrose?). One of my SoCal neighbors lives half the year in Chicago. She has a lab and said she loves living downtown–so dog friendly. Wow! I don't think I'd like to be near a place where I can get wet. TW would love to go to Chicago and especially Wrigley Field. You should come back at night to get pics of those lights! Such a beautiful setting. I see why Pip likes it. I've walked in Grant Park before but Mr. N has never been to Chicago! He likes looking at water but not getting wet. Be have been through Chicago, but need to visit and spend some time. Nice city! Those are some stunning photos, but I especially love that first one! What a beautiful place to visit, and so cool that it's dog friendly! I'd luv to play in dat! Too cool! Looks like an awesome place to visit! I'm glad you're able to spend time there! Thanks for sharing your amazing photos. That's a beautiful fountain….and we love to hear Dog-friendly! Gorgeous fountain and dog friendly to boot! That's an impressive fountain – no wonder it's a favourite spot for dogs and their people. How beautiful! My boyfriend is from Chicago and he has always wanted to take me there but I refuse to go without my dog. (We live in AZ) Good to know there are beautiful dog friendly places! What a beautiful fountain! We hope you felt the spray, Ruby! We visited Chicago, but not that amazing fountain! Maybe we'll go back to check it out. Thanks for the cool post and photos. What a wonderful day! I am glad that you included the disclaimer about the leash! I know that a lot of the dogs I share on my page have had the leashes photoshopped out. Ah that's what a part of Chicago looks like in the daytime. My dad said that Air Canada stranded him in Chicago late one night. He stayed the night in a hotel before heading home the next day. Beautiful pictures! My son just moved to Chicago and I'm so impressed how dog friendly it is! That looks like a fun out n' about pretty Ruby! My Dad says he has always had a good time in Chicago! What a fun outing you had, Ruby! Beautiful photos! What a fun adventure! Love hearing of dog-friendly places! Yay, Ruby! What fun! I'm going to have to take a road trip to see this fountain and the rest of the park! Yipee for Ruby!!! I can literally see the changes in her confidence in your photos. You've done such wonders for her. I'm so happy for all of you. what a great idea to tour your own hometown. I've lived near Columbia, SC most of my life and still haven't seen some of the interesting things here. We have a lot of history because of the Civil War. It's so awesome to see you pics of Chicago – I lived at 14 West Elm for many years and I didn't have dogs at the time. I WISH I lived in the city with dogs as there is so much exploring to do! Old haunts! I've never been to Chicago, but Momma lived there for a few years and loved walking by the fountain! That fountain would be like an aphrodisiac to Jaxson – he would race towards it and jump right in!